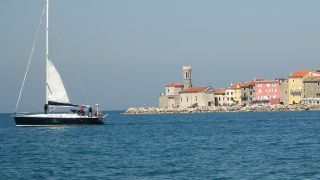 Visit the Slovenian Coast from the other side – comfortable and relaxed, cruising on the blue surface of the Adriatic Sea. Choose among the modern - equipped marinas along the Slovenian coast. Summer periods also offer fast ship transport from Venice and Trieste. Take advantage of the beautiful days and organise a day trip on the sea. Being on a boat can be an exciting experience, whether it takes only one hour or the whole day as you explore the hidden corners of our sprawling coast. Two of our most famous sightseeing ships are Burja and Laho, while you can also hire a water taxi service for shorter trips. It is possible to book the entire ship for your event based on availability. Looking for an organised trip? Browse the offers below of various boat trips. Please contact the boat hire company for availabilty regarding a booking for more people, or if you would like to hire the whole boat. Contact the boat hire company directly for all available options! Comfortable and relaxed, cruising on the blue surface of the Adriatic Sea.